This lovely, efficient needle case can be made over the course of a few weekends. It has a pocket that can be used for scissors, a few packages of needles, or what ever you want. There is also a sheet of folded felt, to be used for your loose needles. I will be teaching this class with Carol, she will teach you how to machine stitch the base together. 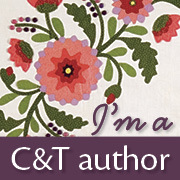 Then I will show you how to make the three-dimensional flowers and silk ribbon embroidered stitches. You will need to have embroidery knowledge for this class. Here is the sampler for the pieces that I will be covering in my portion of the class. Date and time: Crazy Piecing with Carol, April 9, 3:00 – 5:00. Date and time: Embroidery with Christen, April 13 and 20, 1:00 – 2:30. Class Requirements: You must know how to use a sewing machine, and know how to hand sew. You must know embroidery enough embroidery stitches before class. This class fee for Carol, can be paid through Beverly’s. The class fee for Christen is paid directly to Christen. This can be paid by a PayPal invoice, or by cash or check the day of class. Please email Christen:thestoreonthecorner@gmail.com to inquire about the availability of space for the date listed above. 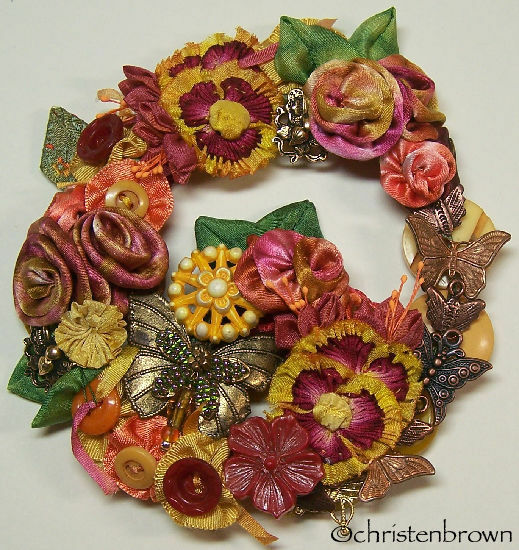 I wanted to share the wreaths that I have included in my book, Ribbonwork Flowers. 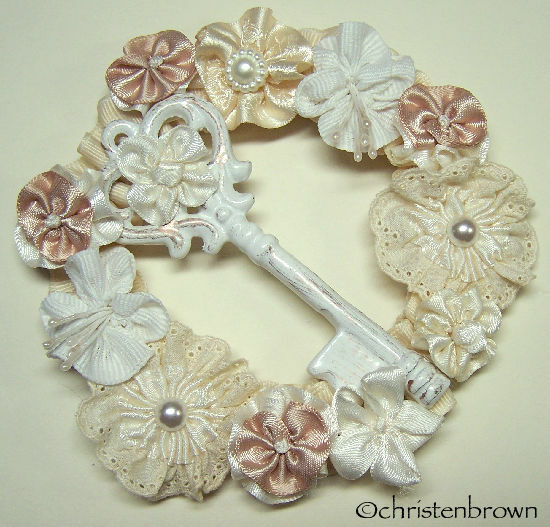 I have a fondness for wreaths, and had fun putting together the components for each of the following ones. 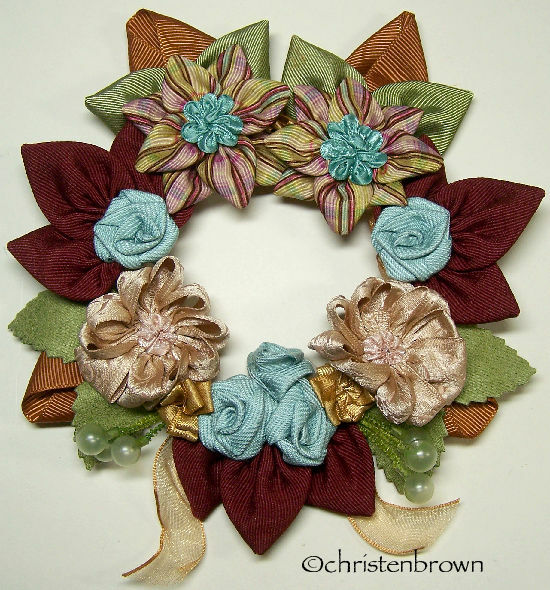 The “Sweet Wreath” started with a wire base, that is covered with ruched grosgrain ribbon. The flowers include the Double Posy, Fancy Rosette, Star Point Petal flower, Knotted Ruffled Posy, Boat Gather Petal flower, and a Rosette. “Spools and Tools” started with a base of vintage wooden spools that are strung on a wire base. I wrapped the spools with a novelty ribbon, that had images of seed packages. The center piece is a pair of garden sheers that were my grandmothers. Each grouping of blue, red and yellow flowers is set into a vintage thimble with advertising on it. I also included Rosettes made from novelty ribbon with a button center, and lady bugs made from grosgrain ribbon. 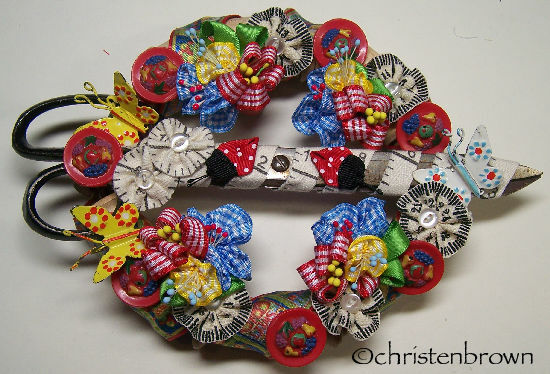 To finish the wreath I added vintage buttons and vintage tin butterflies. The “Rustic Garland” started with a fabulous plaid grosgrain ribbon that I found on sale at Joannes Fabrics. The brown grosgrain came from a friend who worked for Harry and Davids, the burgundy ribbon came off of a pillow that I bought and the turquoise twill tape is from the Martha Stewart collection. The remaining double sided satin, jacquard and sheer ribbons were found in my stash. “Mariposa Fall” wreath started with a wire base, covered in vintage celluloid and Bakelite buttons sprinkled with gold-tone and copper butterflies. I died most of the ribbons, except for the Hannah bias silk that I made the pansies from. The remaining flowers are the Rosette, the Posy, English Miss and Simple Flower.